I’ve not checked the official temperatures but it seems like it’s been very mild so far, with few frosts. And it seems like more is growing than usual. But maybe that’s down to the garden being another year older and vaguely more productive. Here are my first two Japanese mandarins (Okitsu Wase). 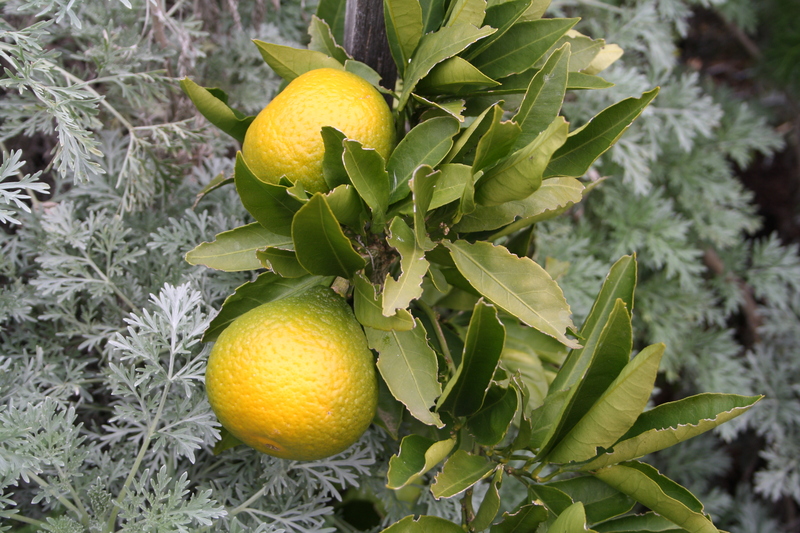 It’s supposed to be the most cold-tolerant of mandarins. This is a tiny tree still – it hardly grew at all this year – but I didn’t have the heart to remove these two fruit, which are taking forever to ripen. They are supposed to ripen in April – May. Will be interesting to see if they do – I’m getting a bit pessimistic…. Also, notice their sweet pear-like shape? 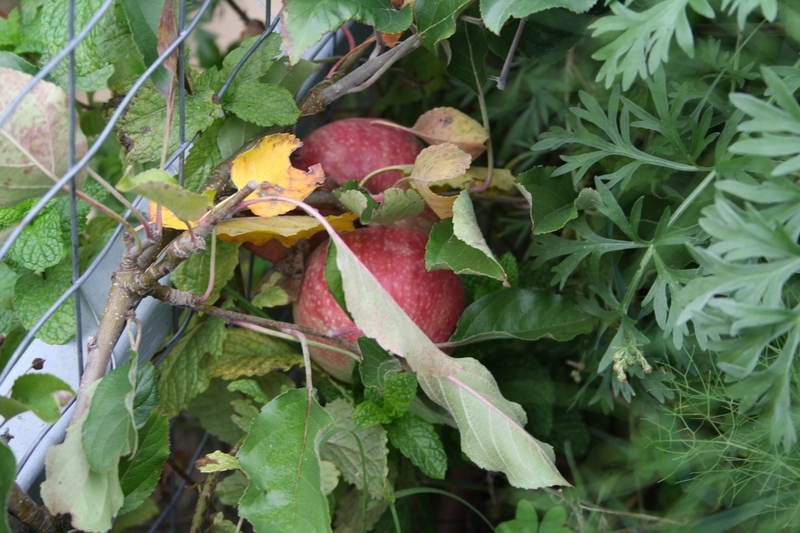 Below are a couple of Lady Williams apples – it’s a low-chill, late ripening variety and could be ready in June or July. It should go dark red. I’ve not heard rave reviews about its flavour or texture from someone who grows in a similar climate, so fingers crossed. These two are on my stepover tree and managed to avoid the scrutiny of the dastardly stink bugs or harlequin bugs or whatever they are called (they are also called extremely numerous and highly annoying). 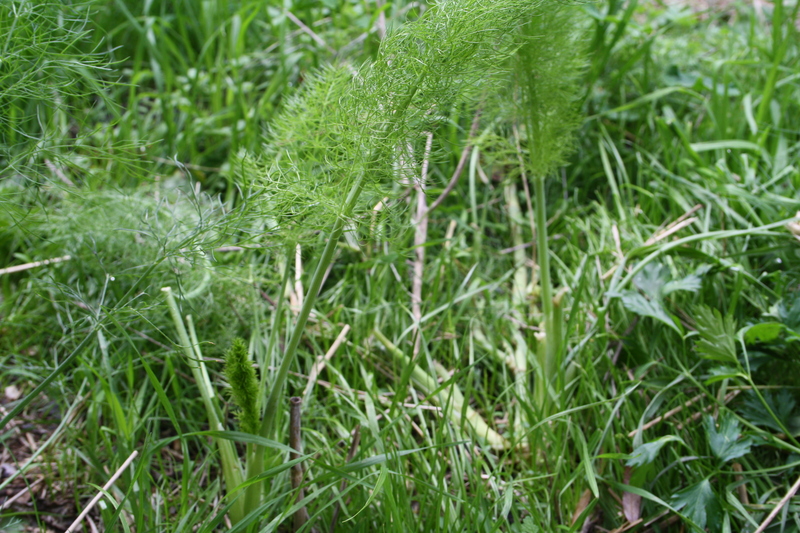 Could it be because of the mint and wormword and bulb fennel smothering it acting to disguise the scent? Or is just because they aren’t ripe yet? Or perhaps because it’s too late/cold for the bugs to be active? 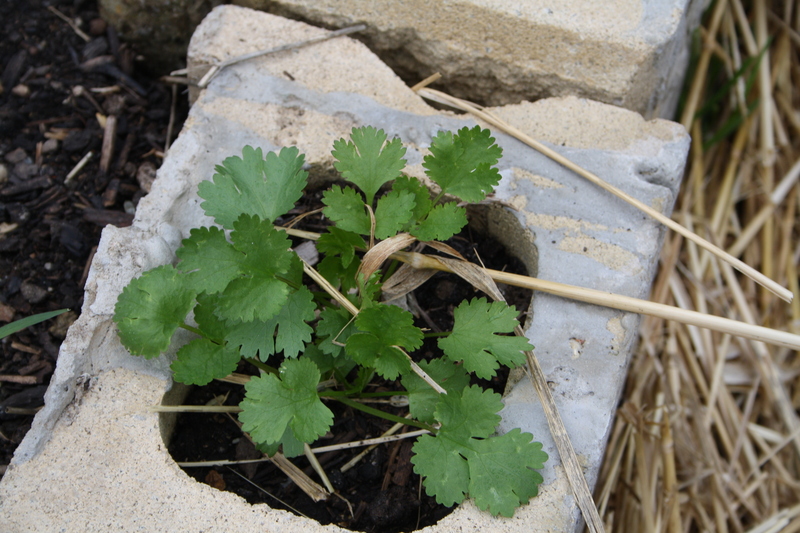 I chucked a whole lot of coriander seeds in a month or so ago and a lot of them have germinated and are growing well now. 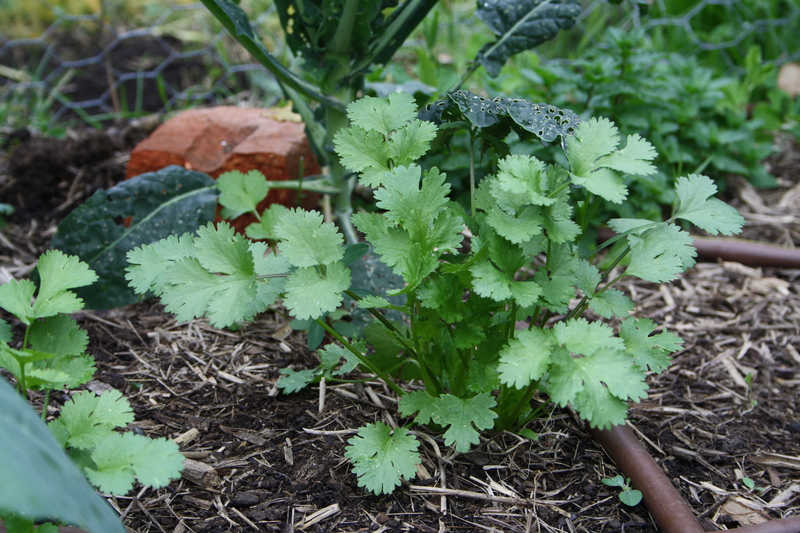 I’ve also got curly-leafed parsley in them too. It grows quite large if you let it. I wonder if growing it in this small container will help contain it, and/or make it go to seed sooner…. 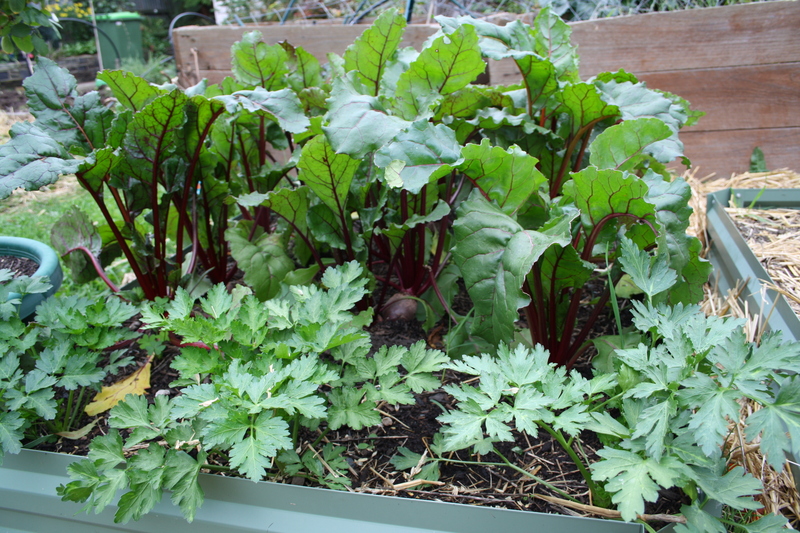 Below I have a crop of beetroot ready to pick. 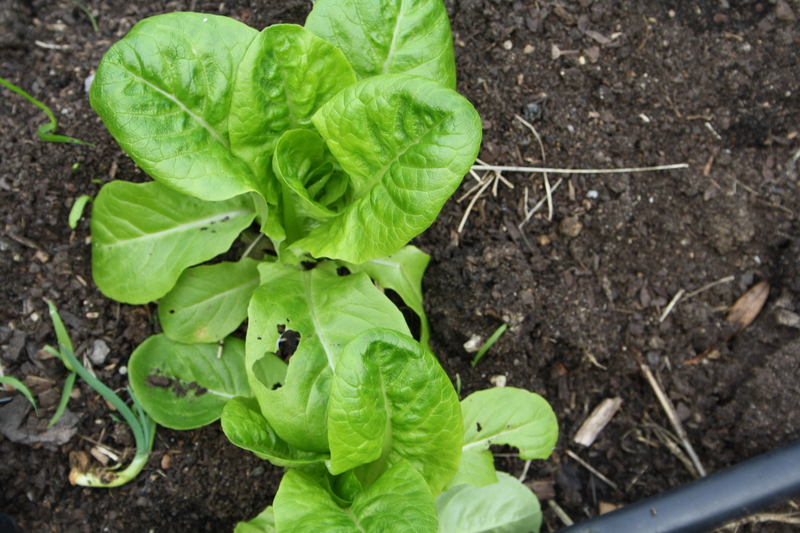 Early spring and late summer are definitely the times to grow it in this climate where we get hot, dry summers. 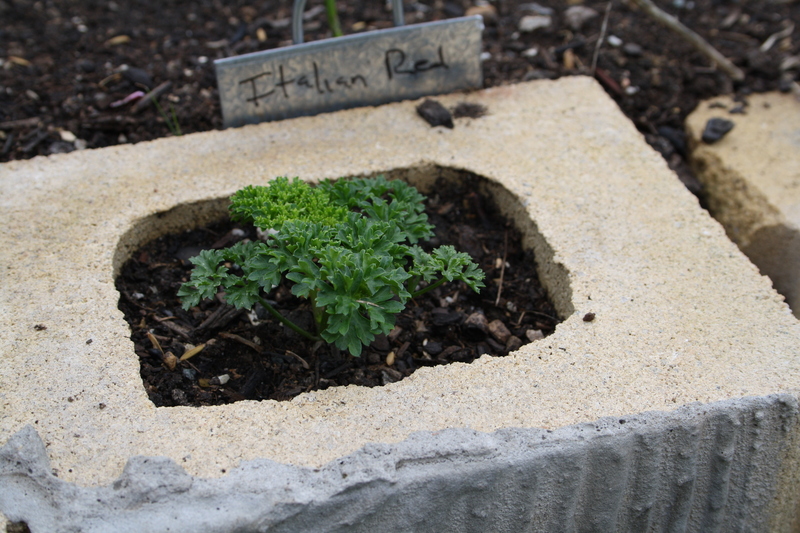 That’s some Italian parsley at this end. 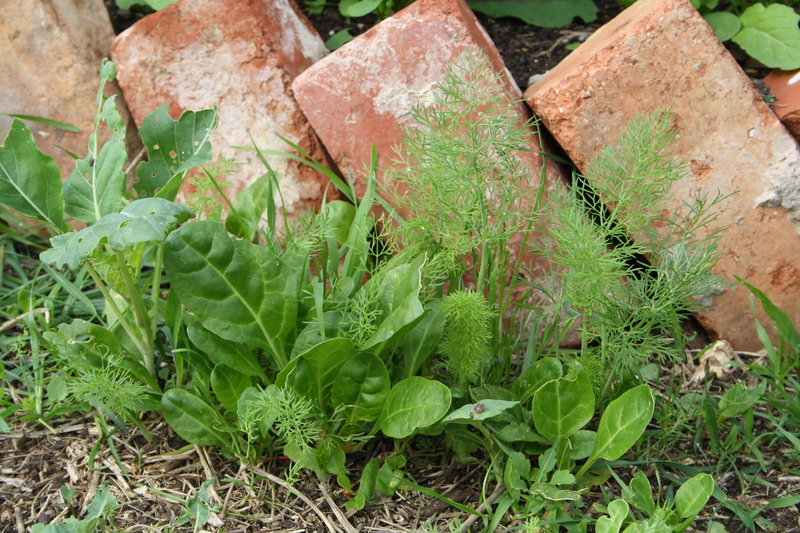 I know there’s a lot of bull and speculation passed off as fact about companion planting, but a pretty legitimate use of the term is for crops that you can grow together to make the most of the space and avoid bare soil and competition for roots and sunlight etc while things are young. Growing fast growing crops in between slow growing crops is another version of it. And I think all these methods have more technical terms in agriculture (eg. 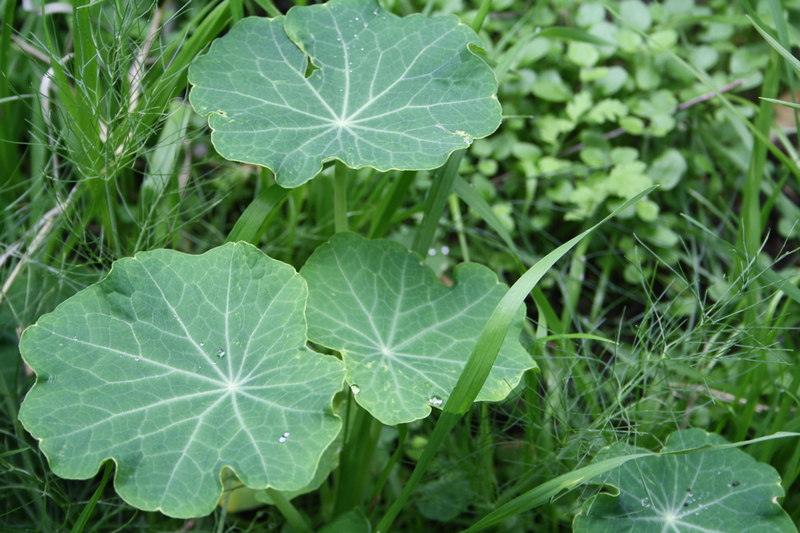 intercropping). 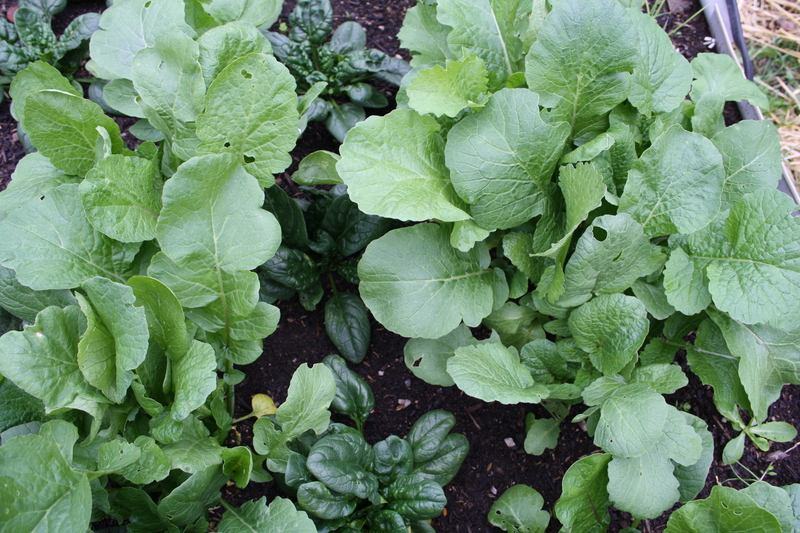 Below I have spinach and some round red radishes growing next to each, the radish seeds (fast growing) planted the same day as the spinach seedlings. 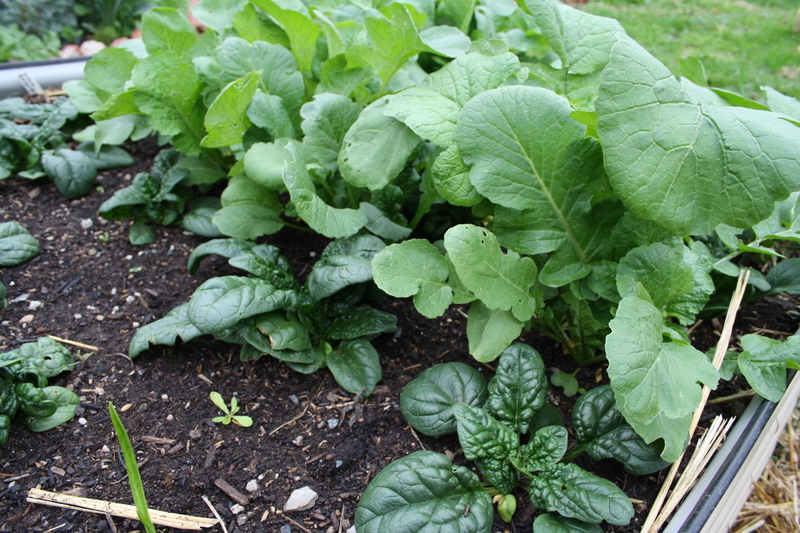 The radishes are about to dwarf the spinach but they are ready to eat now anyway. Good companion plants I say! 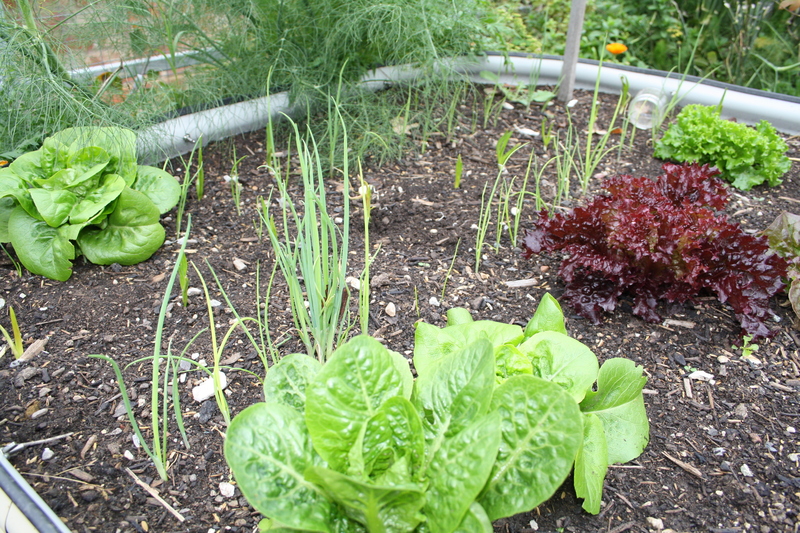 And below I have lettuce, spring onions and garlic growing together. 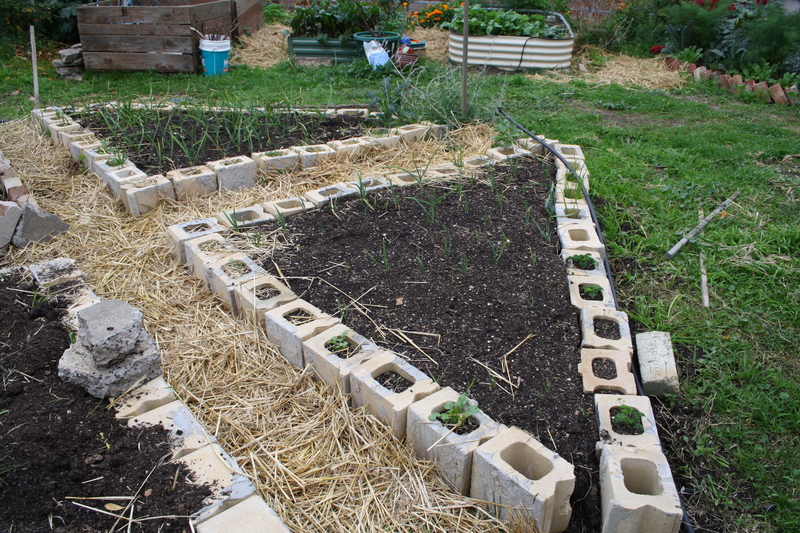 Garlic roots tend not to spread out too much further than the next garlic plant – maybe about 10 – 15 cm square. So at the start of their growing season the garlic isn’t bothered by these other plants. I won’t plant anything else as close once I pick the other crops. 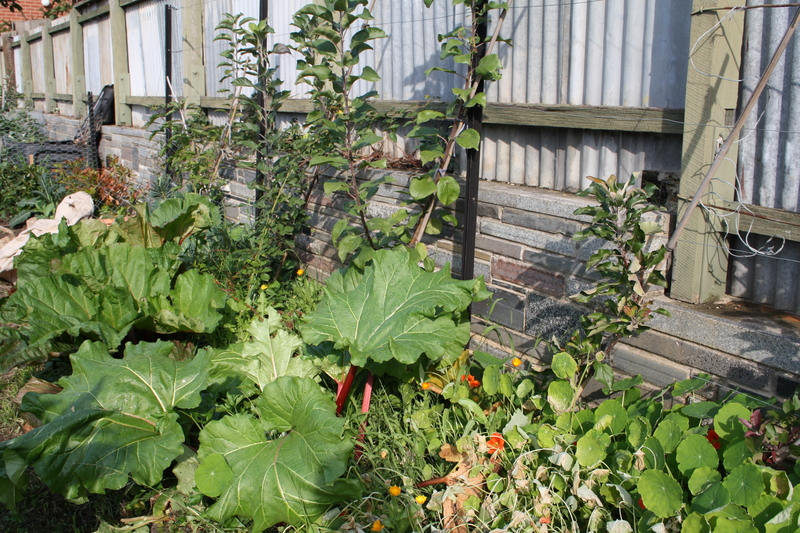 I’m really keen on rhubarb as a companion plant for espaliered apples. Both don’t mind a bit of afternoon shade in summer, and the rhubarb leaves really protect the soil from the hot sun a bit earlier in the day. This is all on drip irrigation in summer. 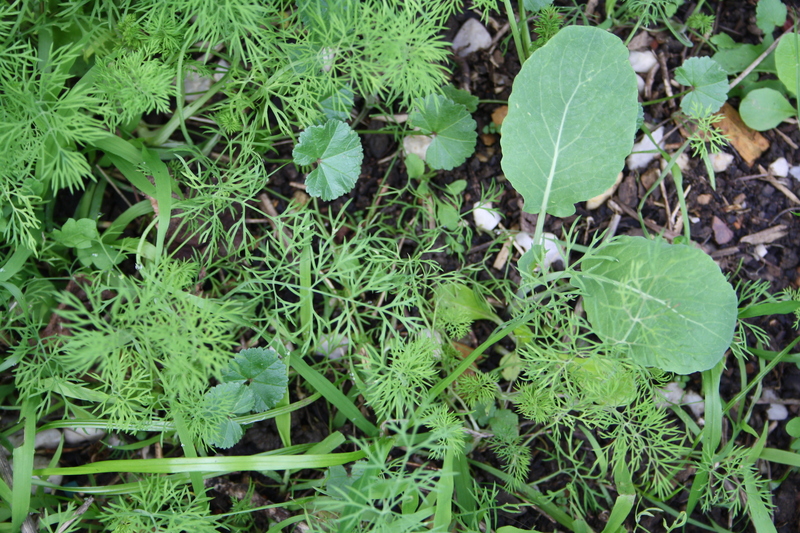 And here’s a couple of edible self-seeded beauties right nearby. Sometimes neglect pays off. In fact I love this crazy overgrown corner. 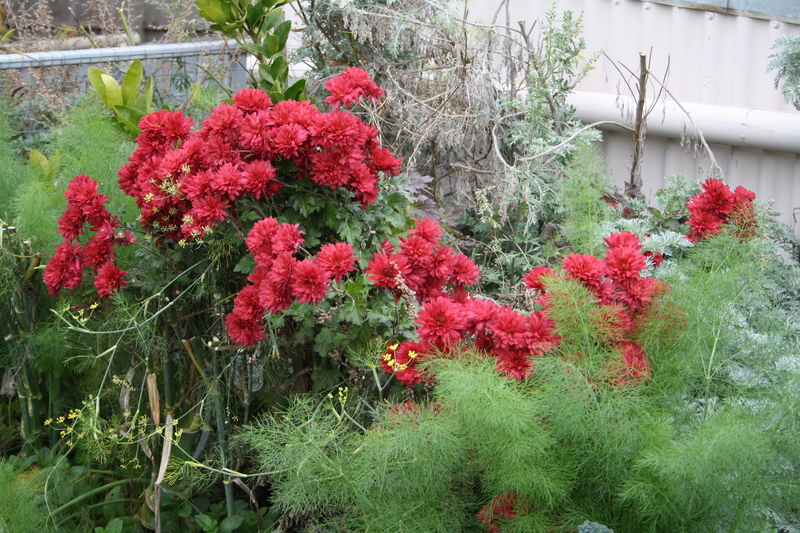 Those red chrysanthemums were in another bed and had to be removed so I transplanted them here – very roughly mind you – and they are bringing me so much joy this year. I also love the different colours of green and blue in this bed. I’ve never thought of blue as a warm colour, but grey-blue foliage definitely gives gardens a warm feel. 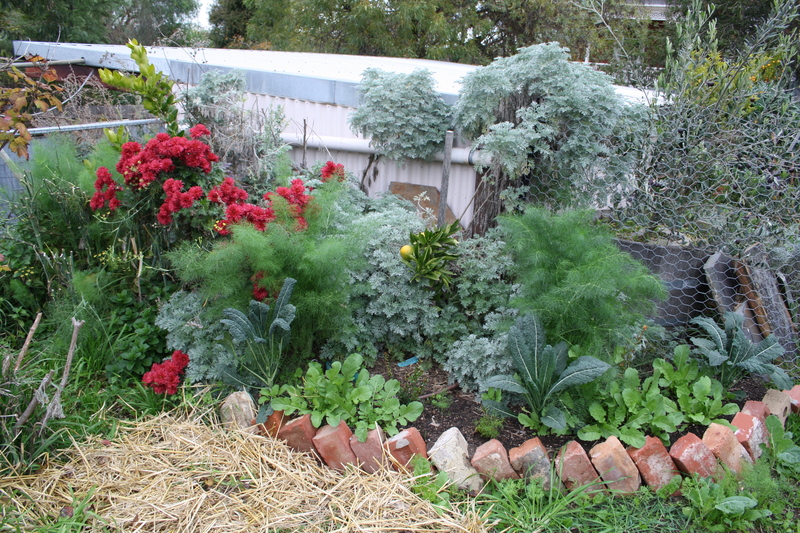 Almost everything in this bed is easy to grow. 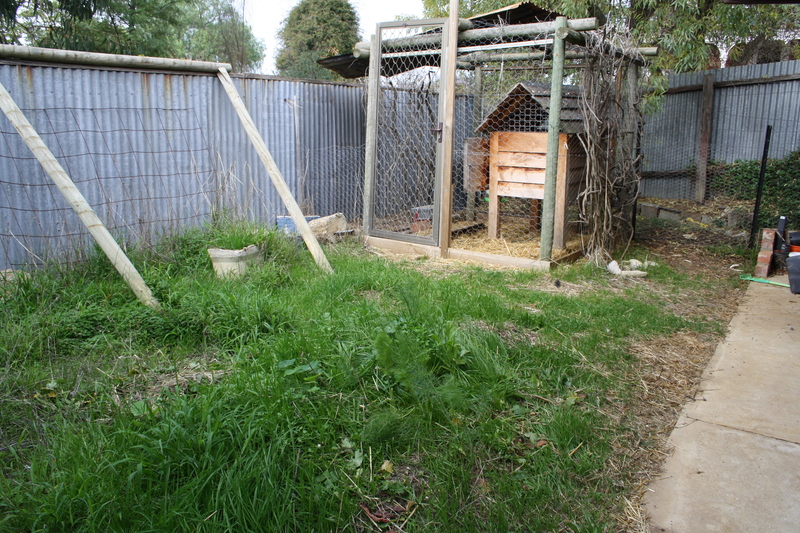 Then there’s this crazy overgrown neglected area in front of our chook yard. Because it’s out of view and it’s very shaded I’ve not yet figure out what to do down there. Currently thinking some shrubs and maybe raised wicking beds. 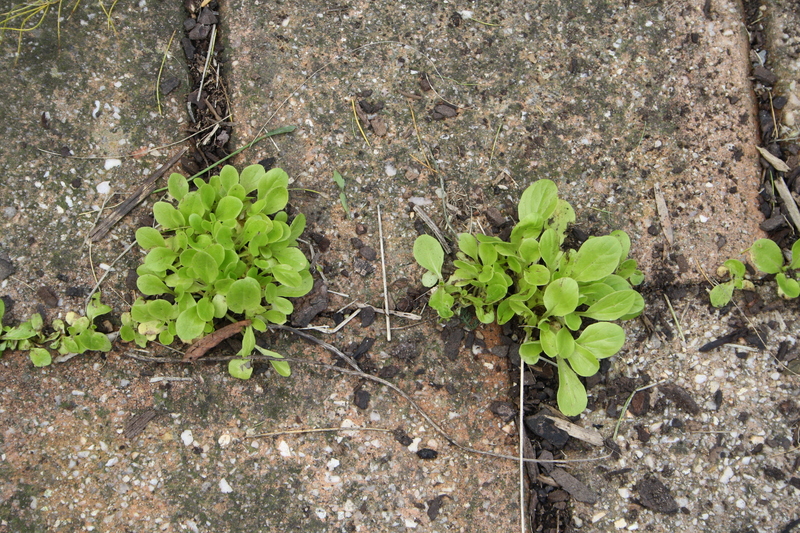 Anyway, at the moment I’m just cultivating weeds. Or so I thought…. 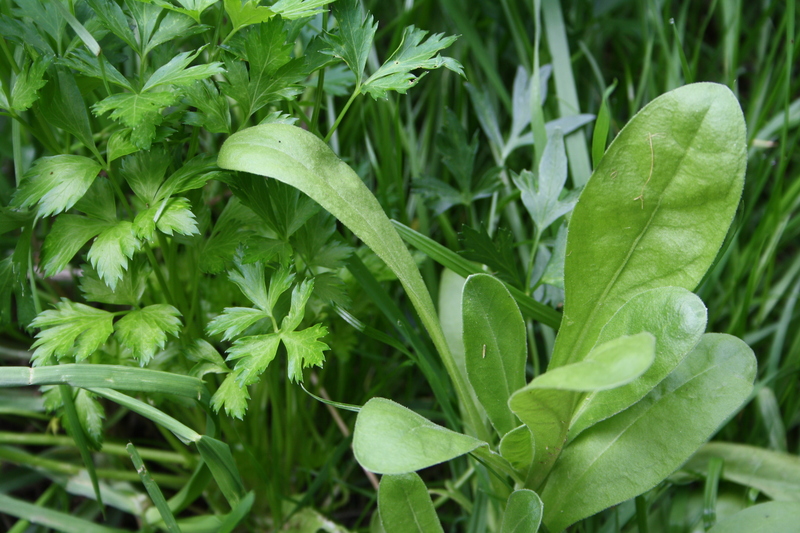 Lo and behold, some calendula and parsley…. Nasturtium and calendula are great work horses in the garden. 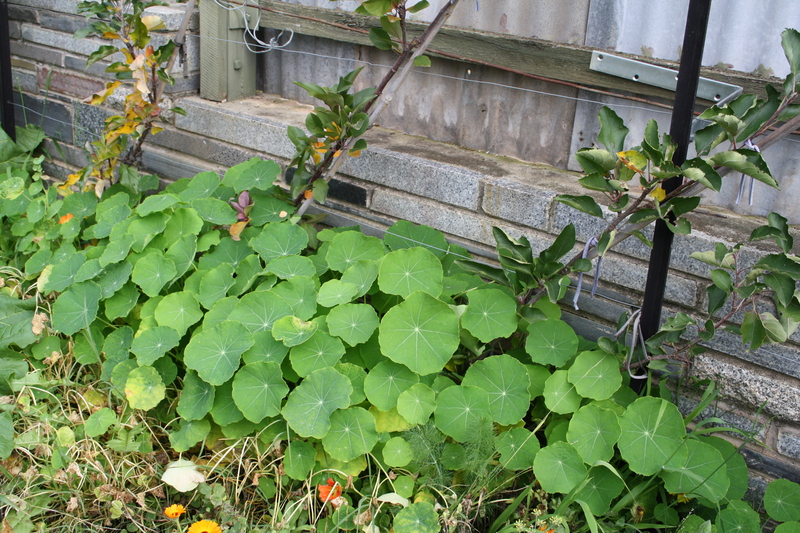 Not sure if this nasturtium is self-seeded or just reappears each spring. It certainly disappears over winter. Usually earlier than this but I think it’s down to the lack of frosts so far this year, although heat from that stone wall would certainly help. You can see a lot of it further out from the wall has died off from frost. And here’s another easy grower: dill. I can’t even remember throwing in this dill seed. It was ages ago. Maybe last spring…. 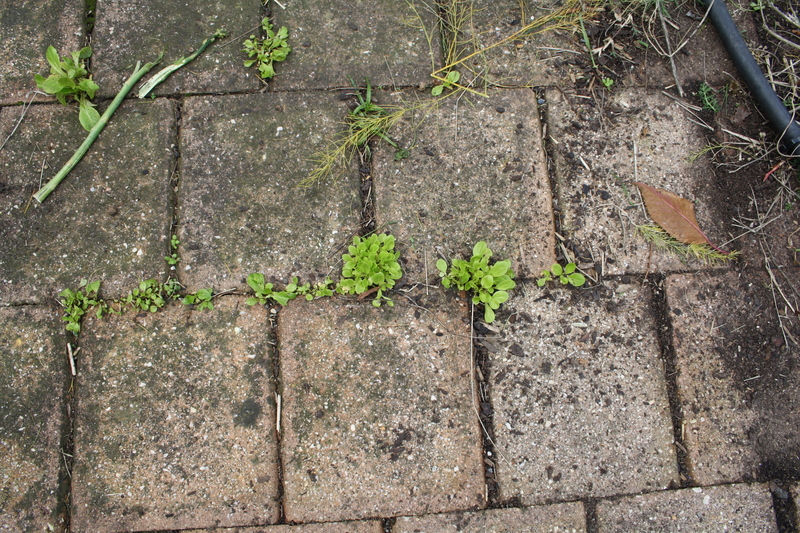 Obviously I didn’t keep it damp enough but this autumn has provided the right conditions for it to germinate. And it does germinate easily with a little dampness. Dill is one of those things that can be such a waste if bought from the supermarkets and vegie shops, sold in plastic and often already rotting when you get it out of the plastic at home, and yet so perfect picked fresh from the garden. 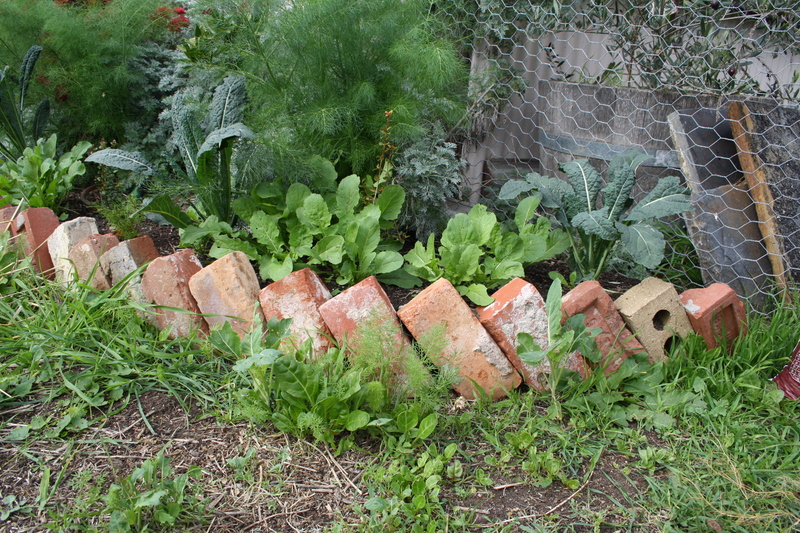 Ok, off to buy some seedlings to fill up some gaps. Toodlepips!